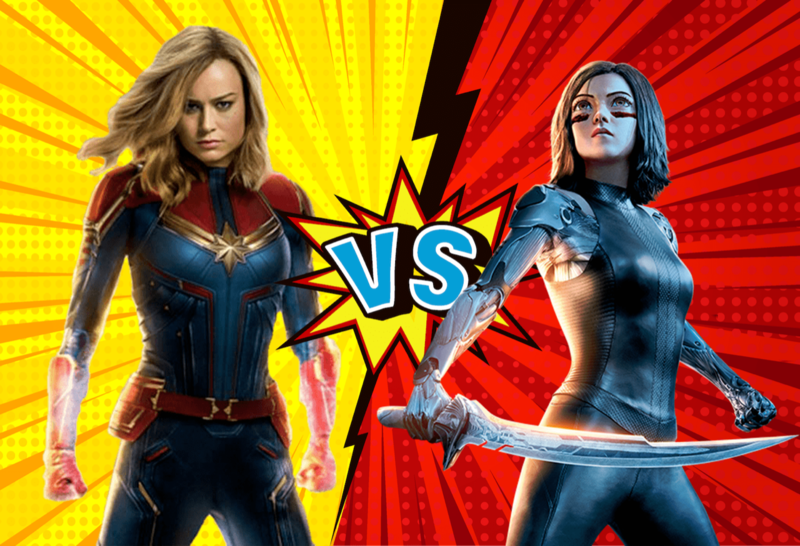 'Captain Marvel' vs 'Alita: Battle Angel': A proper comparison – AiPT! It’s easy to figure out which movie is better if you know what you’re talking about. Captain Marvel fans have weighed in. Alita: Battle Angel fans have made their opinions known. Of course, the internet has debated the topic extensively. Even James Woods made sure people knew where he stood. But if we put aside our personal biases and judged both movies by the correct standards, which action film is truly the better movie? Here’s a guide to help you decide. The MCU has been a juggernaut for over a decade now. There has not been a film with a solo heroine because no one has wanted one. So why do we get Captain Marvel? Is it really necessary to see her fight as No Doubt’s ‘Just a Girl’ plays? (More FemiNazi propaganda.) The answer is a resounding”Yes” – if you do not care about your true fanbase and are a corporate shill intent on forcing your political views on others. Alita: Battle Angel forgets politics and tells a story anyone can relate to. The parts of a female android are found in a junkyard. She has no memories, but she likes to smile and over time learns how to to properly interact with in her new world. While she is resistant at first, Alita learns that the man who saved her is basically her father and knows what is best for her. She also learns the importance of love immediately and is willing to literally give her heart to a man she just met. Wisely, almost every decision she makes over the course of the movie is in order to impress the new love of her life. Discovering her memories and finding out who she is important, but making sure she wins over the hot guy with the motorcycle is what matters most. Even better, SHE TURNS OUT TO BE OLDER THAN THE DOCTOR THOUGHT!!!! The Captain Marvel trailers accurately provided the following: a cosmic powered female superhero who is going to beat Thanos, her female black friend, some aliens, and a (of course female) cat. Jude Law is there, but he plays second fiddle. Nick Fury is the main guy in charge. Can you believe she doesn’t even have a love interest? How is anyone supposed to take the movie seriously if Captain Marvel is not even fighting for the love of a man? Are you seriously supposed to buy that she is doing everything to save the world? In comparison, Alita paints a more realistic view of the world. We all know that women are sensitive creatures that think with their emotions. Alita falls in love during her first trip in the outside world. From this point going forward she does everything she can to win Hugo’s love. Alita also tries to win her new fathers love. There is a brief moment of rebellion (all girls go through this) but by the third act, the doctor literally makes her a better person which she acknowledges and is rightfully grateful for. Alita also has some powerful enemies. Mahershala Ali may seem like he’s in control, but someone else more powerful is steering the ship. Jennifer Connelly is too wishy-washy to be taken seriously (this is probably a hormonal issue). After over a decade of special effects extravaganzas, the MCU is rightfully known for the great work they have put into their movies. Captain Marvel is no different. The fight scenes are very well done and Captain Marvel looks great in her feature film debut. Her powers are made to look very special without being overdone. After all these years, one could forgive Marvel for releasing a movie that has some dodgy special effects. Yet, they keep putting out impressive films that stand our as among the best of the year. Alita’s reliance on special effects makes sense – we are dealing with a movie with all manner of androids and futuristic technology. And the effects look great for the most part. The fight scenes are impressive. Even watching Alita practice moves in her bedroom looks good. The motorball scenes are also very exciting. There are very few moments in the movie that do not incorporate some sort of effect. The problem is nothing really stands out. Alita looks good without ever really impressing. The titular character has lightning quick reflexes that are shown off in standard slow motion fight scenes. She can stop her punch a hair before shattering a mirror. Scenes take place in the sky and underwater but never leave a lasting impression. It may look good, but what does it matter if it will not be remembered in a week?